The Glieder team innovates protein expression for enzyme and pathway expression and engineering. Building on a strong platform of microbial expression systems with freedom to operate (FTO), advanced tools and methods for gene expression are developed. Synthetic biology approaches are applied to tune and balance (co-) expression of several proteins, for example to maximize the catalytic activity of cytochrome P450 whole cell catalysts, folding and secretion of enzymes, which are difficult to express. Engineering of expression systems includes the design and construction of synthetic promoters, terminators and expression vectors as well as the reengineering of microbial chassis strains. 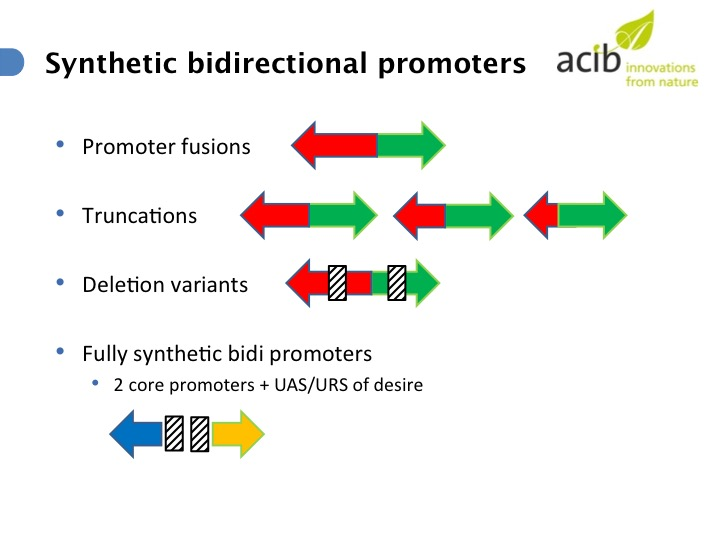 Applicable applied research is a top priority and therefore the construction of genetically stable expression strains is a core interest and activity. 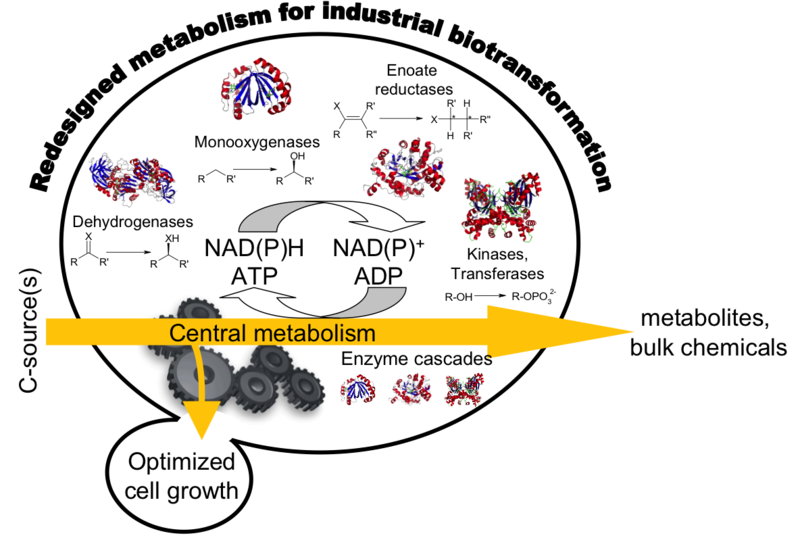 Discovery and Engineering of robust enzymes is applied for industrial biocatalyst development and to adapt enzymes for synthetic pathways. Most of these studies are dedicated to genes from eukaryotes, which are difficult to express in E. coli. WP4 of Chemical Manufacturing Methods for the 21st Century Pharmaceutical Industry is focusing on the transformation of simple carbon sources into high value products by microorganisms. This will be achieved by the design of efficient biosynthetic pathways in industrially relevant platform microorganism that allow the sustainable and economic production of complex molecules in order to reduce the number or even eliminate the necessity of synthesis steps by organic chemistry in production processes of small molecule drugs. In a collaboration between TU Graz, the research Centre Applied Biocatalysis (now acib GmbH) and VTU Technology a platform of Pichia pastoris (Komagataella phaffi) strains and vectors for recombinant protein expression was generated to facilitate industrial research collaborations. This platform of tools is continuously improved to facilitate cloning and genomic information about these strains. The Glieder Group provides innovative expression and fermentation strategies for enzyme production for the partners of this project on “The discovery, development and demonstration of biocatalysts for use in the industrial synthesis of chiral chemicals”. The major focus is on methanol independent production of hydroxynitrile lyases in tight collaboration with VTU technology, Ingenza and acib GmbH. The TU Graz team contributes to this Horizon2020 project (Expanding the industrial use of Robust Oxidative Biocatalysts for the conversion and production of alcohols) by providing new and robust hydroxylation catalysts and innovative co-expression technologies for biocatalysis. Close interaction with industrial partners and lab scale demonstrations in small scale bioreactor experiments under reliable and controlled conditions secure the transferability of the research findings to participating industries. Locally the TUG team closely collaborates with Prof. Rolf Breinbauer and Dr. Margit Winkler from acib to stabilize whole cell biocatalyst preparations for the transfer to other labs and to apply and characterize the new catalysts in robust biotransformations. Internationally the research activities are closely linked with the research of Prof. Mattevi (Uni Pavia), Prof. Schwaneberg (RWTH), DSM and the Autonomous University Barcelona. The in silico screening of genomic databases and own next generation sequencing data is applied to identify novel enzymes acting on polymers and for polymer synthesis. 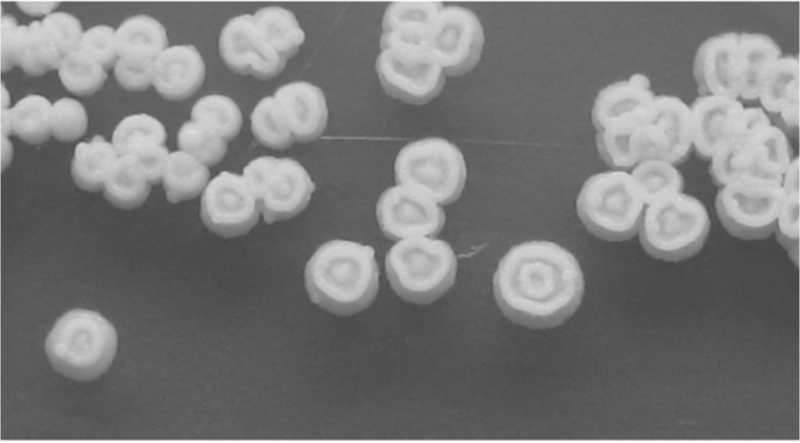 The identified biocatalysts for polymer processing are then engineered for improved technological features. Enzyme and reaction engineering for the biocatalytic production of carboxylic acid derivatives for API manufacturing in close collaboration with Prof. Wolfgang Kroutil and Prof. Kurt Faber (University Graz). 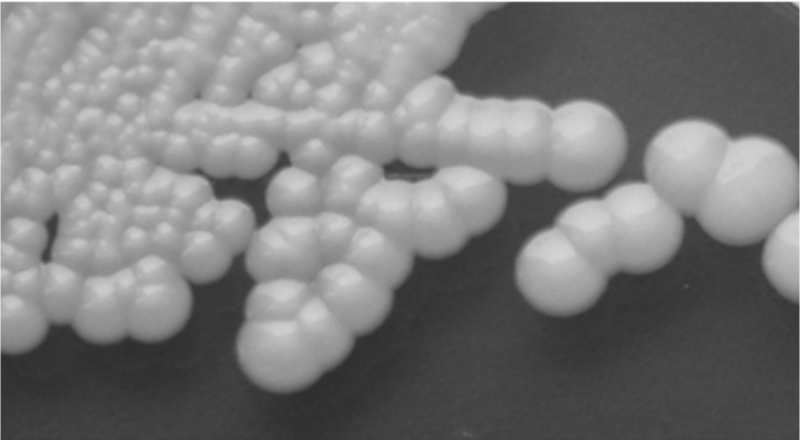 Applying technologies from recent patent applications by TU Graz, the production of horseradish peroxidase isoenzymes for diagnostic, biocatalytic and waste water treatment applications will be improved and demonstrated.